Learning something new can take time, and as a busy contractor, time is a limited resource. Luckily, RaveBuild is here to help with our new contractor Self-Help Guides! Available when you next log in to your desktop version of RaveBuild, the Self-Help Guide appears as a little blue clipboard in the lower right-hand corner of your screen. It’s easy to get started with the guide – just click on the “Guide Me” button of the welcome pop up screen. We start by giving you a quick tour of the RaveBuild home page – showing where to find the toolbar, where you can add and schedule tasks, and also your profile dropdown menu. These are the main elements of the home page, which allow you to do everything from managing your daily schedule to viewing project plans, specs, and other job files. 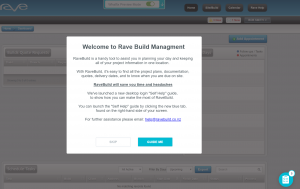 From here, we give you the option to explore RaveBuild on your own, or click on the Self-Help clipboard to access more tutorials. Starting with the RAVE navigation walkthrough which you just completed. Next is another quick walkthrough showing you how to change your password. The third tutorial takes you inside the “Site/Build tab”, with a brief guide of how to find all of your jobs using the sort and filter functions. Next on the list is how to search for scheduled tasks. This actually takes place on the home page and shows you how to manage your upcoming tasks – You can sort them by job, or their due date. This is an incredibly useful tool and goes hand in hand with your “Next 7 Days Schedule” – also located on the home page. Finally, we go back into the “Site/Build” tab, and learn how to upload files to a job. Since RAVE is completely cloud-based, being able to upload files is an important part of getting the most out of our software – that allows you to share quotes, certificates of compliance, and other important files quickly and easily with the project manager in real time. Once you’ve completed the tutorials, the RAVE Self-Help clipboard is replaced by a little blue Self-Help tab, available via the desktop version of RAVE should you ever need a quick tutorial in the future! Just wanted to have a bit more of a chat about some time management tools. What would happen to your income if you were 30% more productive? In the last newsletter you were given a tool that can make you 30% more productive. I wanted to check in to see if you are using this tool to plan your day in advance. The reason I wanted to check in is that it is one of those tools that people can understand how effective it will be, but when you’re feeling snowed under you might feel too busy to implement the new habit – just like the woodcutter who was feeling too busy to sharpen his saw. It’s pretty normal for people to stick with their old habits unless they can really see the benefit of the new habit and the pain caused by not changing. So let’s run this scenario: You start using the tool, but because you’re new to it you only become 10% more productive. This could mean 10% more profit, or 10% more future growth or you get home an hour earlier each day to spend more time with your family. How would that make you feel? What about if you don’t use the tool and things stay the way they are. What will it cost you over the year to have 10% less profit, or 10% less growth or an hour less each day with your family than you could have had? Is it worth throwing away these benefits just to avoid changing a habit? If you have been using the day planner from last week, send a photo of it through to isaacludlow@actioncoach.com and you’ll go into the draw to win a free business assessment and strategy session worth $299! What is one hour of your time worth? One of the best ways to use your time well is to put a dollar value on it. To work this out, just use your hourly rate, or divide the dollars you earn by the hours you work. This will give you a figure for how valuable your time is for each hour. Let’s say for example it’s $50, then you can weigh up whether a distraction or a task was worth your time investment. If a mate calls you and you end up chatting for half an hour, then your call has just cost you $25. Was that a good investment, or could that have been done in your personal time? What about if you forget something and have to shoot back to the supplier. If it’s an hour round trip, then it’s just cost you $50 extra on that job. Is it worth sending the apprentice instead, or is it worth having a checklist or shopping list to make sure you get everything you need the first time? Additionally, sign up for a FREE time management seminar to ramp up your efficiency! 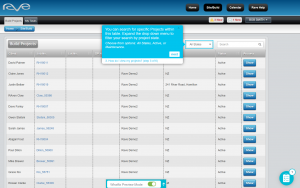 TimeRICH is packed with helpful tools to really get on top of your productivity. 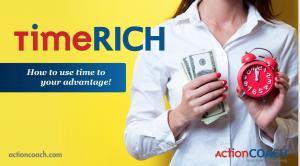 If you would appreciate knowing when the next free time management seminar is in your area, please email isaacludlow@actioncoach.com with “TimeRICH Info please” in the subject line. We all have the same number of hours in the day, our success is dependent on how we manage our self during the time we have. I just wanted to say congratulations on choosing the building industry. It’s a rewarding industry when it’s going well and it’s also a school of hard knocks. So, well done for choosing it, and well done for sticking at it. As the business owner, it’s really important that you are getting your head into the business owner’s role. That means focusing on growing your business and taking it in the direction that you have intended for your business. That’s a constant challenge, because there is a whirlwind of things going on around you that can distract you. It takes some grit and determination to get your head into the business owner’s space. Let me explain what I mean by the business owner’s space: this is where you are doing the tasks or roles that return the most money or add the most value for the future of your business – like putting systems in place, or working on marketing and sales to bring in more clients. As a coach my goal is to get you – the owner – spending your time doing the things that add the most value to your business and doing the things you enjoy the most. As an example: some building company owners still do their own accounts even though it is a task they dread. You can probably pay someone about $20 per hour to do this, while you could be doing other activities worth $50 or more to your business. Obviously it takes a bit of work to train the new person and you’ll need to trust them, which can be hard to do when you first start out. Keep in mind that getting the right people in the right roles is going to expand your business. 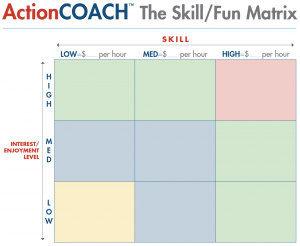 In the table above, have a think about which of the tasks you are currently doing that fit in the bottom left of the table with low enjoyment and low skill that give you a low return. Look for ways to delegate those tasks and spend more of your time as the business owner in the high enjoyment and high skill tasks that give you the best return. You may find that you have days where you arrive at work, check your emails, then you end up spending the entire day resolving issues. It might feel like you’re chasing your tail. This tool helps with that. Make a list at the end of each work day for what you need to get done tomorrow. There might be 10-15 things on there. Go through and rate them as high, medium or low priority and approximately how many hours it might take. 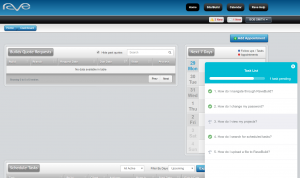 Have a look and see which tasks you can delegate to your team if possible. Choose your high priority tasks and put them into your planner for the next day. Once they have been planned in, tick the planned column. If there is any time left, look at your medium priorities and put them in too. You possibly won’t get to the low priority tasks and that is okay – The box in the top right is to write your top 6 priority tasks for the day, in order of importance, to help keep you focused. The reason this works so well is that your next day is planned out. This means that, when you leave work, you can let go of those tasks running around in your head – because they are planned in. It also means that when you get to work the next day, there’s no wondering about what to do first, you can just get straight into it. Surveys, and my clients, have found that just by doing these simple steps you can be 30% more productive. Unfortunately, no matter how well you’ve planned, there will still be days that will be crazy and things will go wrong. The exceptions will happen, especially in the construction industry, but planning your day in advance and focusing your time on the areas that will grow your business, and that you enjoy the most, will give you a huge advantage. Well done guys. Look forward to catching up again in RaveBuild’s next newsletter. A team cannot be successful if they do not communicate with one another. Whether it be sports teams or your team of workers and subcontractors, this is incredibly true. However, it’s a lot more difficult to reach your crew when they are all in various locations than it is to simply shout to a teammate from across a pitch, right? At RaveBuild, we understand this problem and make it easy for you to work with your crew and subcontractors when you’re not within shouting distance. As with the other features of our software, it begins in the cloud. By having everyone on board with the RaveBuild app, they can receive messages and notifications in real time whether they be at their desks, or on a job. Our task messaging tool allows them to easily communicate any issues to you, with the option of uploading photos or documents as well. 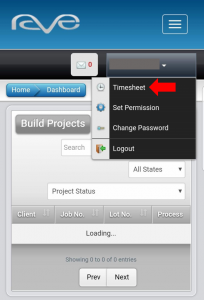 Our software also reduces the need to chase subcontractors around, trying to figure out their hours. 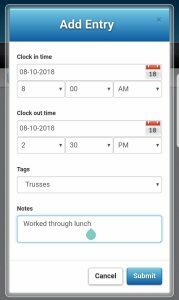 Thanks to our easy to use time sheet feature, subcontractors and team members can easily log on to a job and mark what time they began and completed their work for the day. 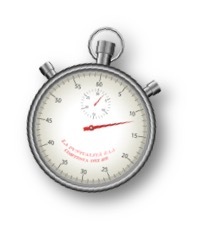 Our software will then keep track of the time they worked. No need for constant phone calls or disputes over how much someone worked, simply enter it into the time sheet, and RaveBuild tracks it all. 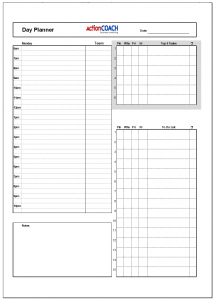 Also, getting to the time sheet page is a breeze! 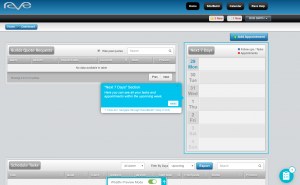 Just click on the drop-down menu in the top right corner, and select the “Timesheets” option. It’s that easy! From there, simply choose to add a new entry, enter your times, what you were doing, and any comments you have, and you’re done. To learn more about our most recent changes and updates, check out the “Technical Updates” tab on our blog, or visit http://ravebuild.co.nz/ to get in touch with us!